There probably aren’t a ton of candy reviews that begin with a discussion about sausage, but of course, here at Candygurus we do things a bit differently. But a sausage patty? I mean, what the hell is it? It’s sick, it’s wrong – it’s nothing I want a part of. 3 Musketeers: I love the brand, but it’s been years since I’ve sampled one. They remind me of Halloween as much as any other candy, and frankly I can’t hear the word ‘nougat’ enough. Mint. Chocolate and mint go together like white on rice, like a cop on a donut, like any other analogy you’ve probably heard too much. So, the proverbial question goes, what could go wrong? It started when I opened the wrapper. Inside was not a solid, powerful looking candy bar, but instead two delicate … links. They looked like sausage links. Now, just as you probably wouldn’t want to get your breakfast served with chocolate chips on top of your eggs if you hadn’t ordered them that way, you also probably don’t want thoughts of breakfast sausage being your first reaction to your candy bar. I really don’t get why there are two bars here. Both are skinnier than a regular candy bar, and the only real thing I can think of is that they are going for a more up-scale, delicate approach to candy. But if so, is the 3 Musketeers brand really the best avenue? There’s something odd going on with this decision. Why do I like Peppermint Patty’s? First and foremost, it’s the crisp bite when you take a chew: they snap, and you know what I’m talking about because they made loads of commercials about this. 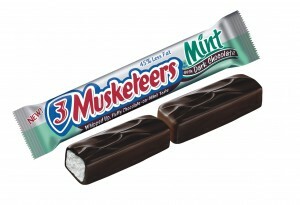 The 3 Musketeers Mint? No snap at all, but instead soft and chewy like a … well, like a traditional 3 Musketeers bar. And the patty wins out because of its shape as well – it’s great to hold in your hand, snap in two, and feel that cold crisp taste you’ve savored for years. The 3 Musketeers Mint links? None of the above. So, if they’re going against that, they lose. They also lose their core audience, because aside from the name there is NOTHING about this bar that has anything to do with the 3 Musketeers brand. Nothing! Where the hell is my nougat? They claim that the mint whipped stuff is nougat, but your memories? They’re gone. Totally absent. The size and shape is different, and even though I prefer dark to milk, even the type of chocolate is different. The bar tastes just fine on its own, but it’s a huge misfire for candy fans because it fails to live up to its brand, there’s a far better option already on the market and also because it made me think about sausage when I wanted some chocolate. By the way, it’s worth pointing out that this transgression isn’t an isolated incident. 3 Musketeers also makes versions in the disgusting sounding varieties of: Cherry, Raspberry, Orange and (hold your breath) Chocolate Strawberry Brownie. I’m really getting sick just thinking about it. Interesting and very very believable. I puked on 3 Musketeers when I was a lad, as I wrote about here (http://www.candygurus.com/?p=482) and I can’t stand these things. And the whole Mint quotient? Please. It ain’t before bed and I ain’t brushing my teeth. Interesting. You hate patties, but you love peppermint patties. I for one love sausage patties. Love ’em. But I hate 3 Musketeers and I aint trying these.